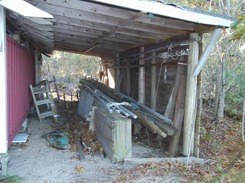 Camp Viking, South Orleans, MA, November 2011. Way back in the 1920s, Norm's mother, grandfather and grandmother were involved with a summer sailing camp for boys, Viking. Growing up, the Viking legend was a regular part of family stories. The family participation in Viking ended sometime around 1947. In 1967, Norm arrived at Viking as a sailing counselor. He stayed for three seasons, 1967, 68, and 69. 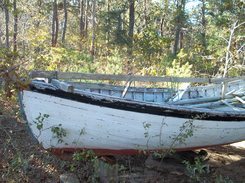 Vega, or the White Whaleboat, as we knew her at Viking, was Norm's parent's first home. Finding Vega in 2011 is a moving experience. 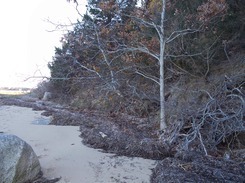 Elizabeth and I found the shore side entrance to old Camp Viking. The camp closed for the last time in 1984. 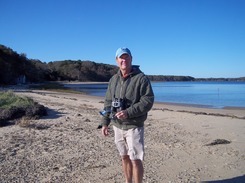 The last director, Tom Lincoln, was a friend of Norm's. At a glance from the waterfront, Viking today looks as if Tom planned to reopen next season. 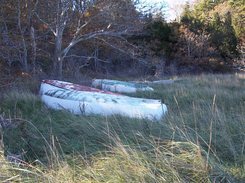 Boats such a Day Sailor and two Mercury sloops were left in their usual places, the spars neatly stacked in the shed, others stowed casually as if waiting for transport to another place. The image below suggests that one day, nobody showed up to work. Getting over to Viking has been on Norm's mind for a while. 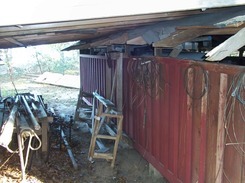 In 1985, I visited an empty camp while on a business trip, not knowing the fate of the business. In 1997, Tom and I met in Orleans at a celebration of 100 years of Orleans summer camps. Finally, in 2011, 26 years after I last trod the ground, I got back for a look. 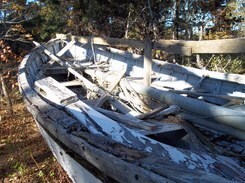 A mission was to see, perhaps for the last time, the old "White Whaleboat." I found her. Pictures follow. 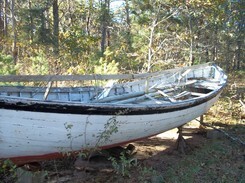 The boat started life as a US Navy sailing lifeboat. The type were modeled after the Monomoy Surf Boat which was modeled after the traditional American whaleboat. They were safe and handy little 26 footers. My mother and father purchased one from Navy surplus after the War. It was decked over forward and made suitable for coastal cruising. After their wedding, mom and dad sailed off on Vega for a honeymoon voyage of six weeks. Sometimes, the stories we heard as kids were told to make on think the honeymoon was six months long. Family archives show mom and dad living aboard, dad rowing Vega into a cove, and sailing in cold weather. 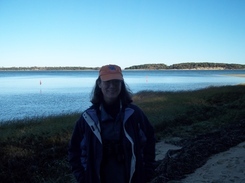 Another family tale is of mom and dad living aboard in Hyannis Harbor. Mom announces to her mother that she is A, pregnant and B, wants to live aboard after the baby (me, it turned out) was born. Grandmother White announced, "No." 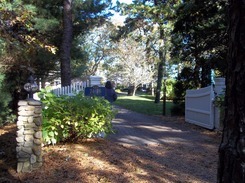 A small house on Lonnie's Pond in Orleans was built. I was kept ashore for a few more years. 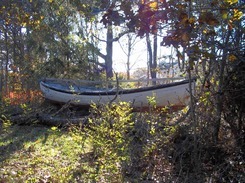 The boat was sold to Camp Viking. From 1967 through 1969, I worked at Viking as a sailing counselor. I took some good natured ribbing about my origins and that boat. The end of the old Viking dirt road has two stunning residences and no hint of the past. 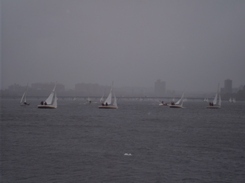 Community Boating Inc of Boston hosted a regatta for the sailors of Boston. 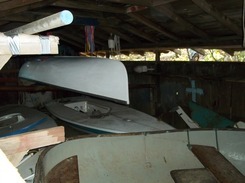 About twenty boats registered from a dozen area clubs. The fleet of Cape Cod Mercuries were used for the event. Who will host next year? The Cape Cod Mercury is a Phil Rhodes design from the later 1950s. It is a 15 foot centerboard sloop that is built like a tank. 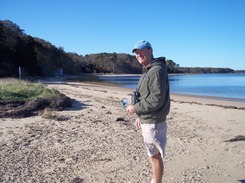 Norman sailed the type in the late 1960s when a sailing counselor at Camp Viking on Cape Cod's Pleasant Bay. They were round bottomed tippy little boats then and not much has changed. 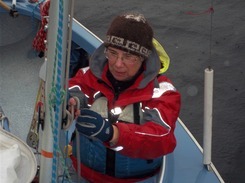 The day was good New England weather, blustery, rainy, cold, and fun to get out on the water under sail. 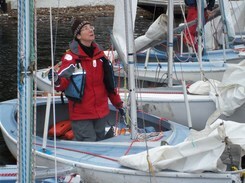 Elizabeth had never sailed a centerboard boat. Rumors of capsizing and turtling dampened some of the enthusiasm. Norm promised (and delivered) not to capsize. We raced three starts, took a break, went out for round two and called it quits early. Too many boats going over. 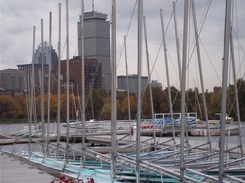 A swim in the Charles isn't on our bucket list. Upshot. We had a fantastic time. Elizabeth came home sore from hiking and sitting in repeatedly. 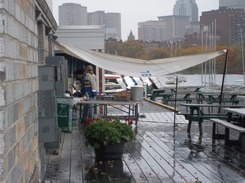 AVERISERA will not be replaced by a centerboard boat any time soon. 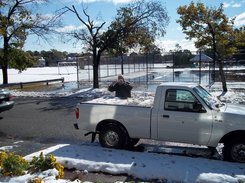 The next day, it snowed a few inches. First snowfall of the season.